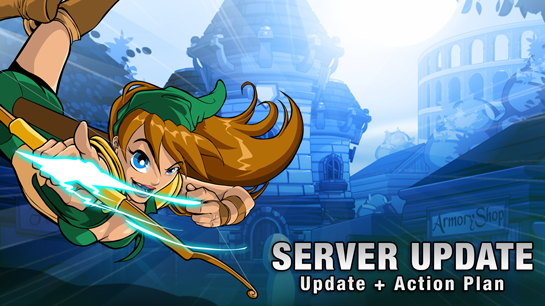 During this Spring Break some of AdventureQuest Worlds and AdventureQuest 3D servers have been temporarily down. This is a result of DDoS attacks (Distributed Denial of Service) intended to disrupt the servers and interfere with your gameplay. Thank you for your incredible understanding and patience. As heroes and Guardians of our community, we hope you join us in our firm stance to never back down to network attacks or threats. We are certainly here to stay. On behalf of all of us here at the Artix Entertainment “Secret Underground Lab”, thank you for being a part of our amazing video game community. I wrote you a special "Year in Review" post and am very greatful to be celebrating our 15th year of making crazy games together with you. Unboxing of the Blinding Light of Destiny! 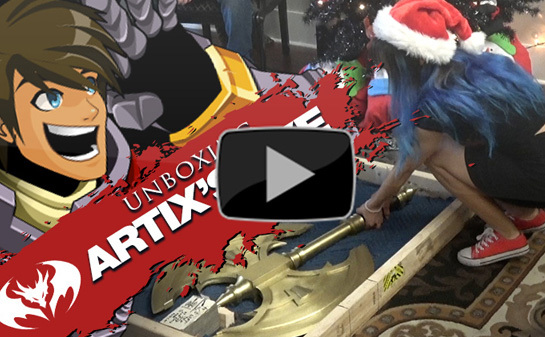 Watch the YouTube video as the team unboxes the real life version of Artix's axe, the Blinding Light of Destiny. It was forged by the legendary MichaelCthulhu. 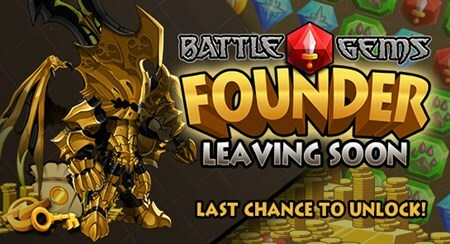 Thank you to all of you on Twitter and Facebook and our forums who were so passionate about having the statue in Battleon change to honor Daimyo. Equal thanks to whichever of you sneaky staff members went and actually made the change! It was heartwarming to see that the fountain in town now has a statue of our very own symbol of loyalty, hope… and extreme moonlight undead-slaying. So today is the start of a brand-new holiday… Wishing Day. We are going to add a series of quests onto the fountain, which will be a story that people can enjoy year-round. And on this day next year, a very special thing will happen, just as, today, and today only, everyone can get the Daimyo statue to place in your in-game house and members can get the Daimyo member pet. It has come to my attention… though a flurry of angry and concerned messages, that one of our former artists made a completely inappropriate, gender-bended, not safe-for-work parody of one of our childhood mascot characters. Needless to say, we do not approve. I am going to contact the artist and do whatever is in my power to have it removed, and ensure their future works do not involve any of our beloved family-friendly characters. Artix - still a Goodie Two Shoes Paladin. P.S. When AdventureQuest 3D got a “T” for Teen rating.. this was NOT the intended outcome. I just finished the full script for Sekt and the 4th Dimensional Pyramid and am waiting to see Alina's response. This was a challenging assignment. I broke three big rules and think you will enjoy it. You will have a surprise NPC which you WILL NEVER guess. This is the 5th Chapter of the Throne of Darkness saga which starts this Friday with a war... then next Friday with a challenge arena, and the story part will begin the following Friday. I really hope you enjoy it. Alina reaction: I LOVE the story we're telling here! The twists (both in the art and in the plot) are awesome. As a note... NEXT week we are releasing the 4th Dimensional Arena. 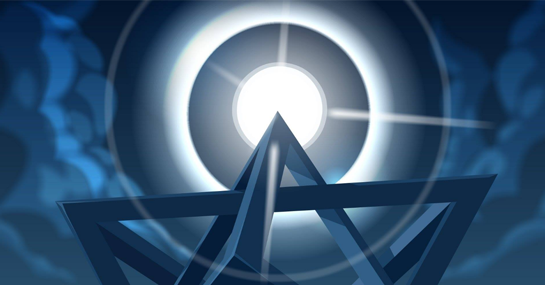 Artix's 4D Pyramid release is not one we want to rush, and now that the story and design are done... we can REALLY begin building it! Greetings friends! I am writing to you from my super uncomfy seat at the hospital with a triple dose of exciting news. On tonight’s episode of the American Ninja Warrior TV show, 3 friends of AQWorlds will be running! Pleaase join us in cheering on our very own ninja trailer, Drew Drechsel. Also, the “King of Obstacles” Mack Roesch who declared on AdventureCouch that he would try out for the show… well, he made it on! Finally, my close friend Reko Rivera who will be unmissable with his red ninja outfit, haircut, and… well, he normally shows up breathing fire. At the stroke of midnight on Sunday, we got a very… very… special surprise. See the official announcement video on my Facebook page. It should be noted that she was born on 6/6/16 during a storm -- likely future member of Dage’s Legion? Special secret story: Our AdventureQuest 3D Kickstarter was funded, we were Greenlit on Steam, and I found out we were having Mia all on the same day! 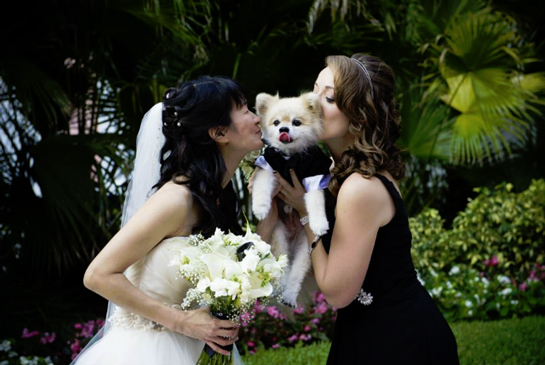 I was asked not to publically announce this because, you know, things can go wrong… but as you can imagine, that was THE BEST day ever. On Friday our new main storyline, Throne of Darkness, continues with a much more serious and deadly release… Pax and the DEATH ARENA. It should be noted that these are Elite Drakel… they claim to be the descendants of the ancient great Dragons themselves and believe they are the rightful heirs to this world. Pax has several Elites with him including one very rare Albino Drakel. This character was based off of a close childhood friend of mine-- perhaps I could tell you a more funny story about this in a later post. Xeven's themesong from the new www.AQ.com Throne of Darkness release was written and performed by Ghost. You may recognize his style... he did most of the music in DragonFable too! I am really excited to see you reaction to tonight's new story release. The map looks crazy, but the actual adventure is a fun, daring, and often deadly chase through time and space. Who are you chasing exactly? Xeven the time traveling assassin of course! After the first release, a lot of players commented that Xeven was too cute and nice to be a villain. As usual, I rewrote the script for this week's release to intertwine our player's comments into it. 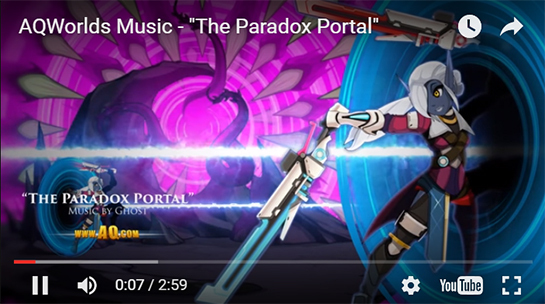 Be sure to let me know how you feel about her *after* you make it through the Paradox Portal. Her attempts to kill you may be offset by the promises of cake. * MAN, time-travel is cool! Throne of Darkness is Here! The moment we have been waiting for is finally here, a brand new main storyline for AdventureQuest Worlds has just begun... and you, if you are reading this, you are going to be a part of this from the very start. Our first adventure is told by the DeathKnight Vaden. He hails from a castle that is completely made of bone. Legend has it that any hero who ventures into the castle and perishes will either become an undead servant OF the castle or WORSE... part of the castle of bone itself! YOU have ventured into this place... this dungeon of horror... and we know this because Vaden is telling the story about it in-game RIGHT NOW! Bonus Member Dungeons Coming Next Week! We will be doing special bonus releases, giving MORE backstory into specific areas and sub-bosses from Throne of Darkness. The majority of these releases will be member only, which will satisfy a long-time desire for more content for the players who are making these releases possible. Thank you for making this story a reality. If you read my previous Design Notes, you know that this story is incredibly important to me... it has one of the things I have been saving for so long. And to see it happening, well, let's just say you can see misty eyes through giant skull helmets. sometimes banging your head repeatedly on the table over and over and over saying "why, why, why, Artix why,"... and most importantly... laughing. 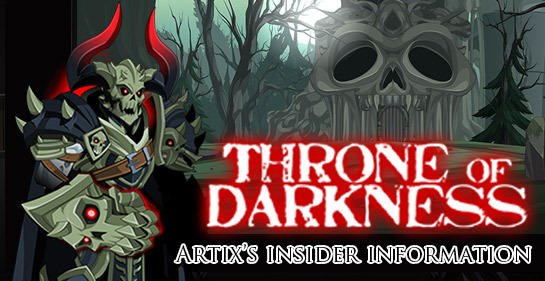 The Throne of Darkness begins this Friday… a brand new main storyline for AdventureQuest Worlds. There are 7 villains in this story, each will unlock a new major dungeon. I like using the term dungeon… even when describing an outside area like a forest or clouds you can walk on. To get a flying eyeballs view of the land we shall soon explore together, let us sent forth our scout… Jimmy the Eye! Jimmy the Eye is a flying eyeball. As he flies North, he thinks to himself… why is so little known about the North? The rain blurs his vision, and every clap of thunder makes him jump. They seem to be coming from a series of portals. Is it a rip in time and space? Or perhaps it is… WHAT THE!?!?! The sun has gone black and he obsesses on an indescribable twisted shape of triangles. Perhaps the rumors of the 4th Dimensional Pyramid were true? If that is true then… but before there is time for another thought, he hears weapons clashing and screams. The Death Pit Arena… a half-Dragon General stands watch as gladiators do battle. No less strange than what he thought he had seen in the clouds just moments before. But if he ever said what he thought he saw up on those clouds... with all its bacon and cats they would just call him crazy. It is a secret place. Meet to scheme and solve their "problems." That place, without question… was the THRONE OF DARKNESS. 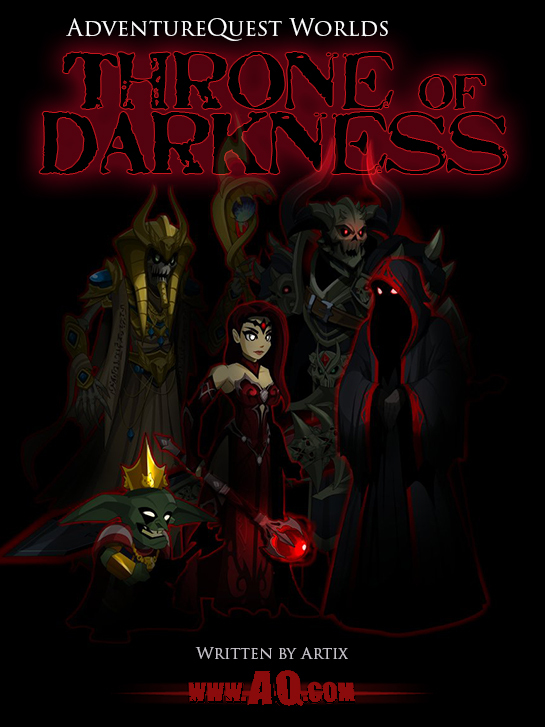 This Friday, our new saga Throne of Darkness begins in AdventureQuest Worlds. 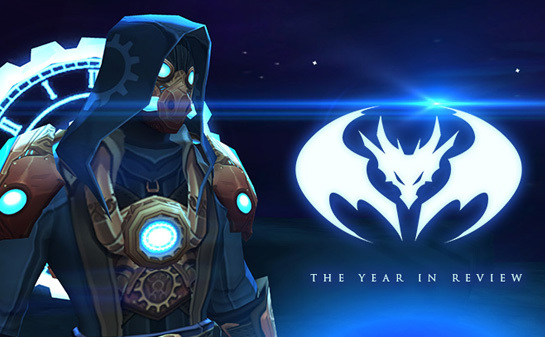 If you have been following me on my Artix Krieger Facebook or Twitter, then you have probably seen the posts from when I started writing it. But the truth is… I wrote the original concept for this story way BEFORE the creation of the original AdventureQuest. Due to the unusual way the adventure is told, I always expected it to be used for a new, stand alone game. See, in normal adventures you play it from your point of view. But The Throne of Darkness is from the Villain’s point of view. Instead of happening in real time, the Bad Guys are sitting around are telling stories about you… so everything you do, have already, technically… already happened. This is a lot of fun, because you can do things in the past, that can actually change the Villains at the table here in the present. You will see what I mean in the opening adventure “The Castle of Bone” which features Vaden the Death Knight. It is so crazy… little did I know, so many years ago, way back then when I first came up with this story… that it would be about you. If you went back in time and saw my childhood sketches and ideas from The Throne of Darkness, you would be surprised to find you recognized the villains sitting around the table-- Xan, Sepulchure, The Mysterious Necromancer, Drakath, and the Vampire Queen (later named Safiria.) Yup, we have secretly been using parts of this story for years. So if you have liked the 13 Lords of Chaos and other things I have written in the past... You are probably really going to enjoy this too. To avoid using the same characters again, I wrote new a fresh new rogues gallery of villains. If you see any subtle similarities between the new villains and previous ones… you can probably take a good guess who they are taking the place of. And that is a fun thing that you will understand, and most people will not get. I have tried not to mix any of the existing stuff into this new plotline, but every time I see clever posts from players on Twitter you make me want to break the rules. Take Vaden the DeathKnight for instance. Some players think he might be related to Vordred, or there might be a link because it sounds like Valen (Sepulchure’s original name), or that is might actually be Artix’s son (because Aidan and Vaden sound similar.) -- I am not going to rule anything out. The ink is not dry yet. 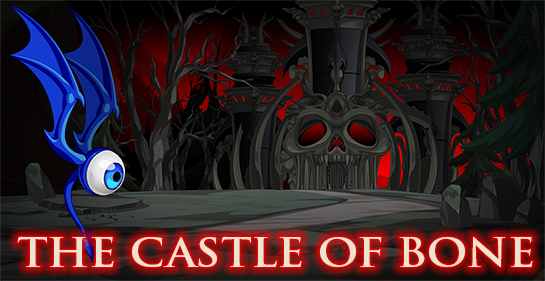 Check in tomorrow for a sneak peak at the dungeons that Throne of Darkness will open up on the map. There are 7 Villains seated at the table… each with a lair more dangerous and crazy than the last. Battle on! 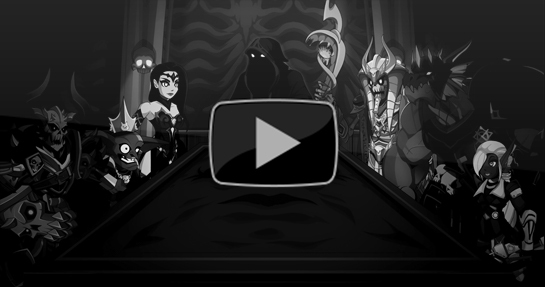 New AdventureQuest Worlds Main Storyline! Greetings friends! Artix here. Be prepared... Throne of Darkness starts this Friday. WHAT!? 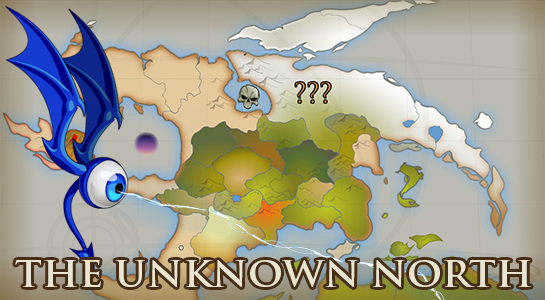 Yes, it is an entirely new main storyline for AdventureQuest Worlds which will open up a new area of the main continent. This story will be told in a unique way that we have never attempted… until now. If you have been wanting us to focus on story, create new major characters, and to explore interesting and bizarre new places… then you are going to love this Saga. At least I hope you do! That is why I personally wrote this saga for you O_O. Check back for tomorrow’s special “insider secret” design notes where this new saga actually came from. 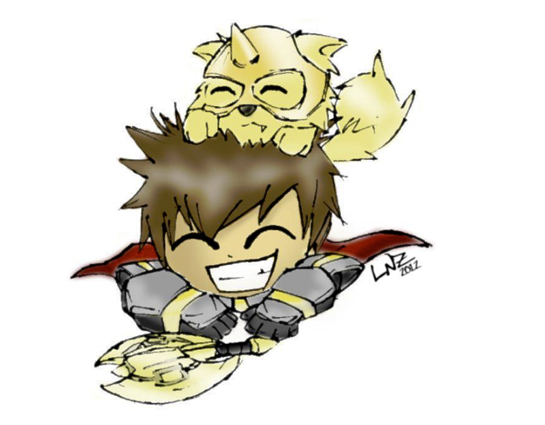 Oh, and if you are not already, be sure to follow me on my Artix Krieger Twitter & Facebook for random stuffs! 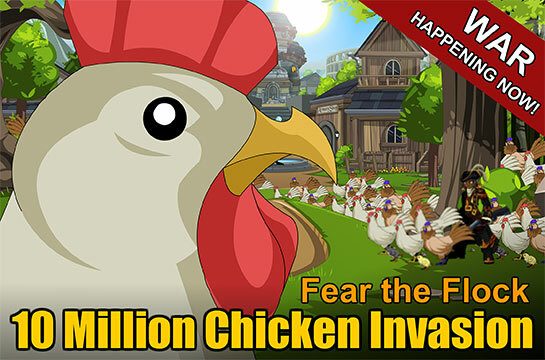 The 10 Million Chicken Invasion BEGINS! Artix writes: Birds of the father, attack town together... Over the years we have fought back armies of Dragons and the evil undead. We have extinguished pyromancers, and sent creatures from the stars running back to their homeworld. But never… NEVER in the history of our great town… has the pecking order been turned on its head like this. Until today, to be called “Chicken” meant the person was a coward…. after this army of 10 Million chickens pours through the town, being called “Chicken” might make you one of the greatest warriors of all time. Hi guys! Alina posting now! So, here's the thing. 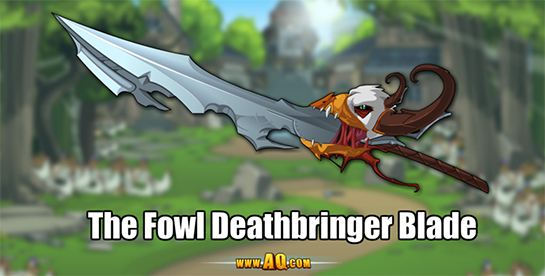 We've got a LOT of chickens attacking Battleon! And there's nothing that makes our heroes rush to defend town more than GEAR! So we've put together some pretty tweet (and cheep!) rewards for you as an incentive to battle. Chick them out in Lart's shop NOW, plus the ones dropping from monsters, and find even more rewards when you unlock the boss fight at 100%! The big question is: WHY is Lart the ChickenLord's army attacking... and HOW do we stop them? Understanding the answer to those questions is the key to this war. But CAN we stop them? I believe the answer is 100% yes! Will we need a hand to do it? Maybe! It will take COOP-eration and a good deal of pluck, but I know we can do it!